Do you ever need something to keep your child’s attention for a little bit while you are trying to make dinner or just trying to think for a minute? 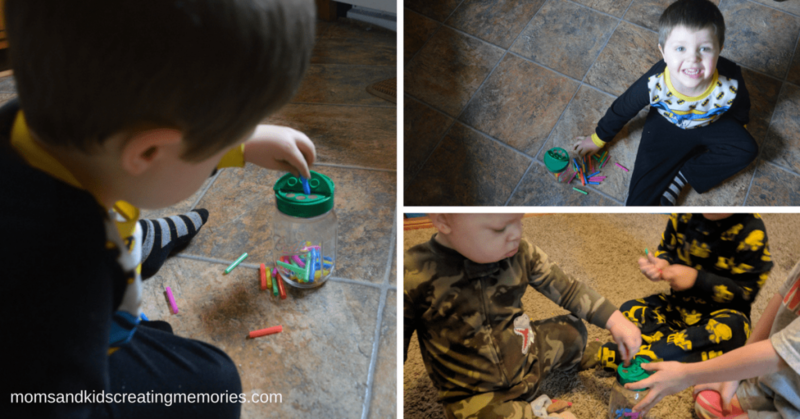 My kids love this activity and it is easy to put together and you don’t need many supplies. This also is an activity that you can give to your kids and not have to supervise. 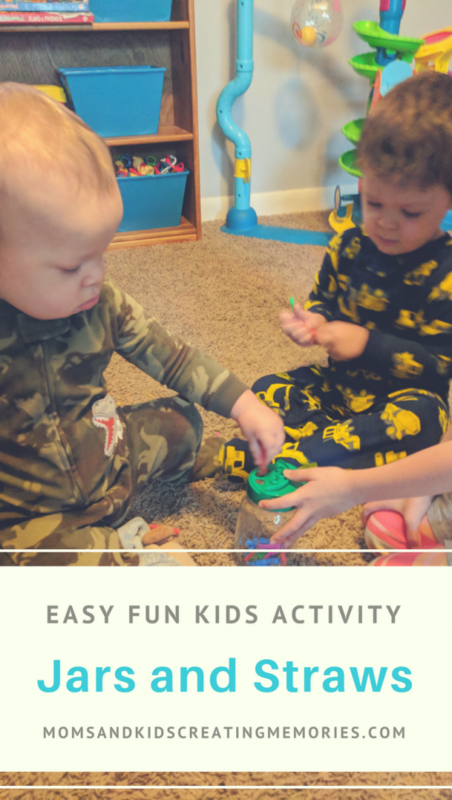 So the next time your kids say you they are bored or you just need a little bit of time by yourself, grab these few supplies and let your kids go to town having some fun (and working on their fine motor skills too). The lid from the Parmesan Cheese container can screw onto a canning jar. I found it hard to get the parmesan cheese container cleaned out well and canning jars are very durable so I’m not concerned about my kids playing with it even though it is glass. The jar has been dropped multiple times or been knocked around and nothing has happened to it at all. 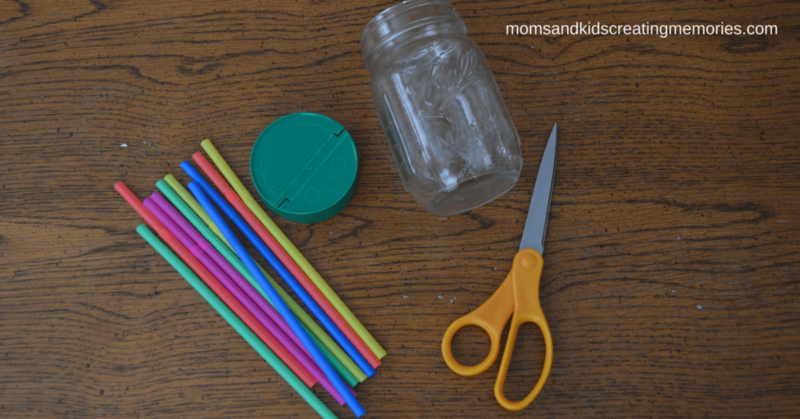 All you need to do is put the lid onto the jar and cut the straws into 2-4 inch long pieces. Open up the side of the lid that has the three small holes and let you kids go to town. My kids can sit for a long time putting the straws in and out, even my one year old. The only thing your little ones might need some help with is opening up the bigger hole side of the lid to dump the straws back out so that they can do it all over again. If your kids know their colors you can do all kinds of activities with this. 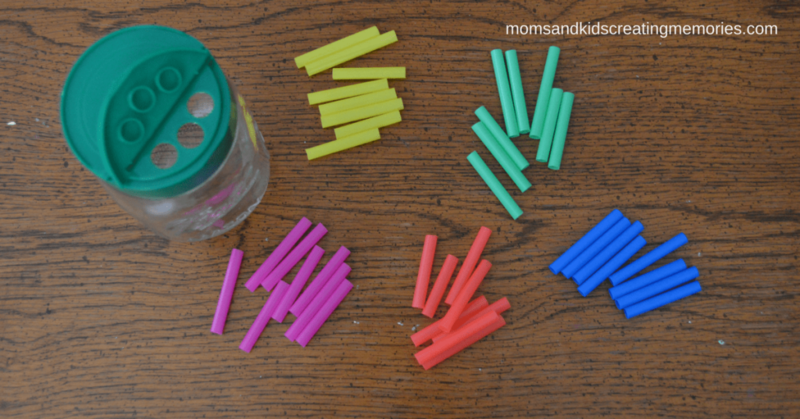 You can have each of your children have a certain color straw so that they can learn to take turns and work on their colors. 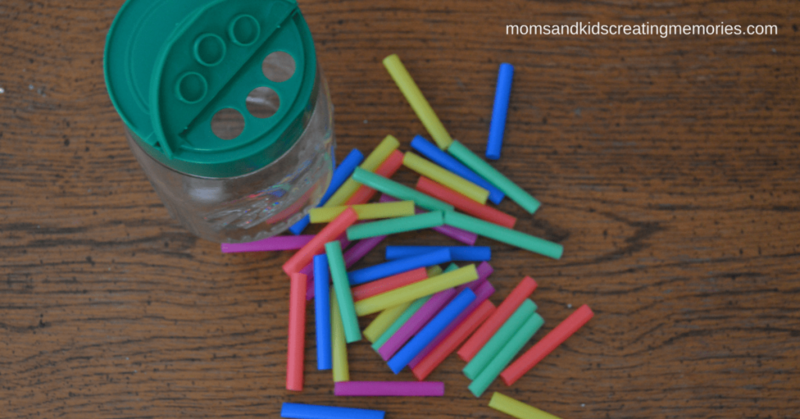 You can also have your kids work on numbers while doing this activity. 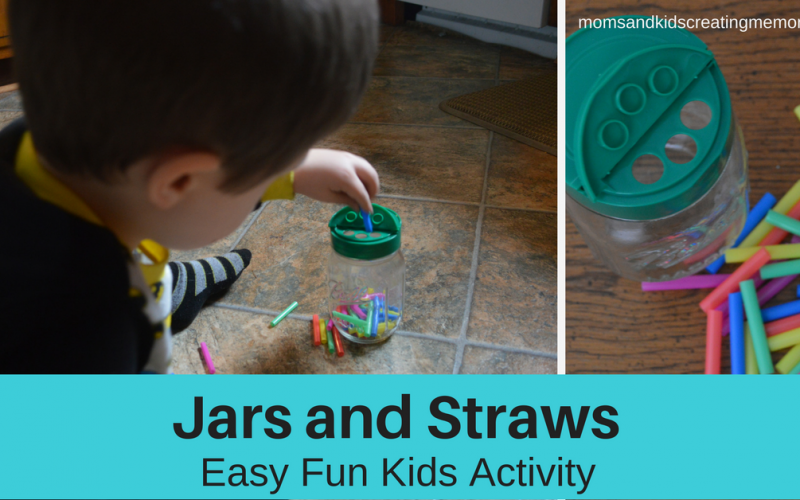 Since all you need is a jar and the straws you could easily have your kid take this activity with them for many different occasions. Do you need something for your kids to do while you are cooking dinner? Have them bring it into the kitchen and do it on the floor. Need them to have their hands busy while you need to make a phone call? Give this to them and they can sit next to you or wherever you need them to be. Have to take your kids to a doctor’s appointment? Let them play with it while you wait for the doctor to come in. Try this out with your kids and let me know what they thought about it and where you used it with them so you could get something done. 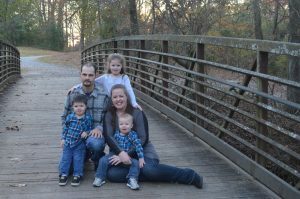 I would love to hear back from you. Ever have a bad day with your kids? You are low on patience and they keep fighting? Need something to help change your bad day around? Sign up below for a Free Printable with 16 Ways to Make a Bad Day Better With Your Kids. 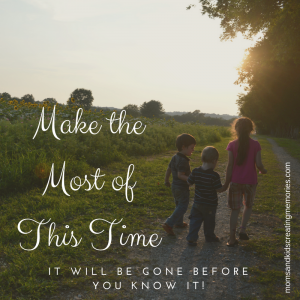 You will also be signed up for the weekly newsletter where I share tips and encouragement for moms and keep it real, because motherhood is the most rewarding job but it is also very difficult and we need to support each other and encourage each other.